Surrealism started here, in the imagined world of a little known Belgian painter, William Degouve de Nuncques. Without La Maison Aveugle (The Blind House). there would have been no Rene Magritte, no Empire of Light. Its English title, The Pink House, while descriptive explains nothing. 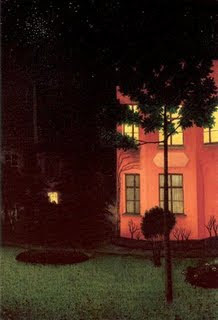 The first thing the viewer notices is a house glowing with strange light, as though it were midday. But it is nighttime, and a sprinkling of stars dot the sky. 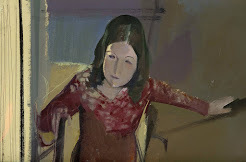 What could explain the relation between the pink, apparently inhabited part of the house, and the shadowed rear part, its broken window panes revealed by a solitary light? Magritte the Belgian was an artist who knew and honored his sources. In 1955, he created his own version of Fernand Khnopff's At Fosset Under the Fir Trees (1894), including an outsized squirrel picking at the pine cones. Another Belgian, the poet Emile Verhaeren (1855-1916) claimed that both La Maison Aveugle and The Canal had been inspired by stories of Edgar Allen Poe. Also, in what may have been a case of symbolist hyperbole, Verhaeren described Degouve's landscapes as "obscure dreams of a morbid climate." In favor of his interpretation, Verhaeren was Degouve's brother-in-law, married to the artist Marthe Massin in 1891. Three years later Degouve married Juliette Massin, Marthe's sister and also a painter. Degouve himself broke silence in 1911, writing that he had intended the lighted windows to represent "life immobilized." Degouve used lines to frame fleeting intuitions of the invisible, an experience Maeterlinck characterized as. "the individual face to face with the universe." His geometrically structured spaces contain mysterious depths, Camille Lemmonier, a member of the older generationof Belgian artists, was the first to note that Degouve's paintings contained a "motionless undulation." This is a symbolism largely devoid of human figures. Another temperament would have searched for answers in metaphysical realms. In The Canal even the hour is obscure and the bare trees offer no conclusive evidence of the season. The deserted building appears subject to some peculiar trick of the light. Broken window panes again punctuate the facade. 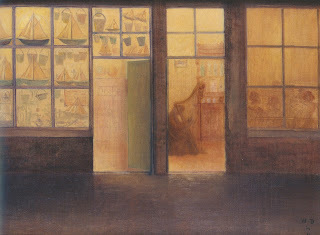 Degouve's use of a broad horizontal canvas, severely compressed, creates a claustrophobic feeling seen in landscapes by his contemporary Fernand Khnopff. Belgium in the late 19th century was in the forefront of industrialization, with its attendant urban upheavals and dislocations. At the same time there were cities like Bruges and Ghent, remnants of the long gone Burgundian court, preserved in a decayed state like insects embalmed in amber. Against this background, the recurring motif of immobility, the frustration with the explanatory uses of the visible world, make sense. Maeterlinck, who received the Nobel Prize for literatire in 1911, even discerned intimations of this in the Greek classic. "It is no longer a violent, exceptional moment of life that passes before our eyes—it is life itself. Thousands and thousands of laws there are, mightier and more venerable than those of passion; but these laws are silent, and discreet, and slow-moving; and hence it is only in the twilight that they can be seen and heard, in the meditation that comes to us at the tranquil moments of life." In the insubstantial powder of pastels Degouve found a medium fit for the moist, heavy night air. 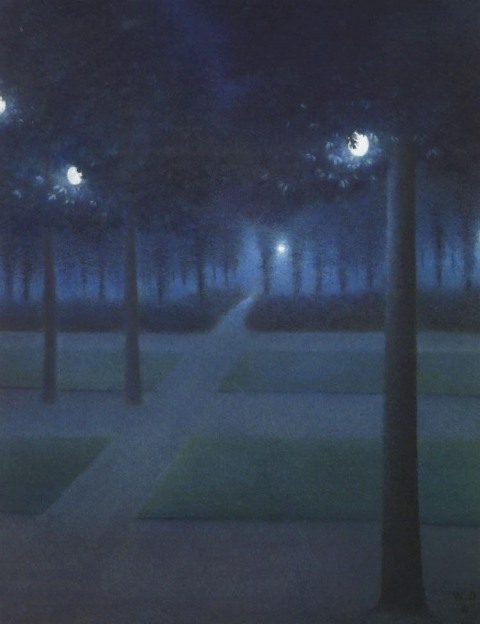 In such an atmosphere, the gas lamps of the royal park in Brussels illuminate the symmetrical layout as though it were the otherworldly work of a phantom gardener. In its particulars, the image could not be more accurate if it were a photograph. But Degouve has chosen to depict the garden's rectangular pattern from an oblique angle, taking the straightforward and turning it into something slightly strange. Now you begin to feel the thrill of recognition the surrealists felt. A master of static drama (notquite an oxymoron) was Maurice Maeterlinck (1862-1949), the central figure of Belgian literary symbolism. He was well-suited to understand the melancholy Degouve. Born into a well-to-do family in the torpid city of Ghent, de facto capitol of Flemish-speaking Belgium, Maeterlinck became the leader of a movement carried out largely in French. A childhood divided between winters in an urban townhouse and summers in the country was similar to the one that Fernand Khnopff experienced, shuttled between Bruges and the forests of the Ardennes. Like the aristocratic Khnopffs, Maeterlinck's family could trace is roots back to the 14th century chronicler Froissart. His play Les Aveugles (known in English as The Blind or The Sightless), premiered in 1890, was just as influential at the time as The Bluebird or Pelleas and Melisande In Les Aveugles, Maeterlinck created a group of characters guided by an old priest, who dies, leaving them alone with their fears. None of the characters is drawn realistically. They are depersonalized, outlines within which the actors and the audience invent their interior worlds. Not a bad description for the tree roots foregrounded in The Leprous Forest from 1898, one of Degouve's most openly morbid works. Gnarled and twisted tree roots searching (blindly?) 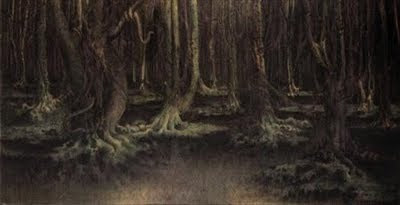 for light express the artist's intuition of sadness permeating the natural world. In the art of Degouve de Nuncques, we share the surrealist thrill at seeing the unseen. Seek out the warmest corners! a soldier passes, he is a sick-nurse now. (nothing is where it belongs). on a day of sunshine, the smell of ether. - Hothouses by Maurice Maeterlinck (1889), translated from the French by Richard Howard, Princeton University Press: 2003. 1. William Degouve de Nunques - La Maison aveugle (The Blind House), 1892, Kroller-Muller Museum, Otterloo. 2. William Degouve de Nuncuqes - Le Magasin mysteriux, 1898. private collection, courtesy Kroller-MullerMuseum, Otterloo. 3.. William Degouve de Nuncuqes - Le Canal, 1894, Kroller-Muller Museum, Otterloo. 5. William Degouve de Nuncques - Le Foret lepreuse (The Leprous Forest), 1898, private collection, Belgium. Thanks, HWB. I'm happpy that you enjoyed it. More coming soon on Degouve de Nuncques, so stay tuned. "Maître du mystère" said the title of the last exhibition Degouve de Nuncques in Belgium (Namur, 2012). Very nice, thanks, Jane. Tania, I read your articles on Degouve de Nuncques last year and immediately ordered the book (French version)because of you. Thank you. You are so welcome, Octavio. Português é uma bela langiage.